Every year, just a few miles away from Shearer Hill Farm, the Whitingham Maple Festival takes place. This self-guided tour allows visitors to tour several sugarhouse throughout our area. 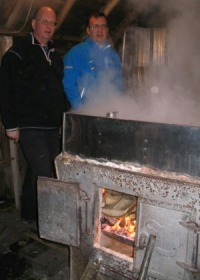 You can meet the sugarers, see how they run their sugaring operation, and sample their syrup hot from the boiler - and let us tell you, NOTHING tastes better than freshly boiled Vermont maple syrup. The sugarhouses you'll visit are both old and new, so you'll also get to see a wonderful cross-section of maple sugaring techniques and traditions. Shearer Hill Farm also has a sugarhouse, though it's not open to the public because every year our guests enjoy helping farmer Bill gather sap and boil syrup. It's a really fun time. 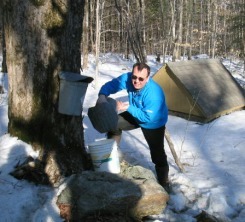 There's even been an article in the NY Times about our maple sugaring. 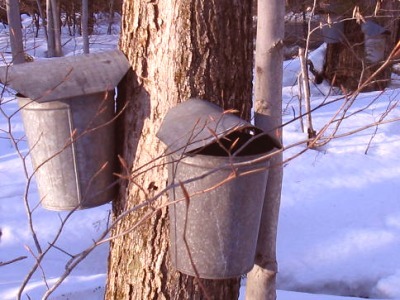 If you and your family are interested in joining us for the Vermont maple sugaring events at Shearer Hill Farm, please give us a call or email. We'd love to have you join us. 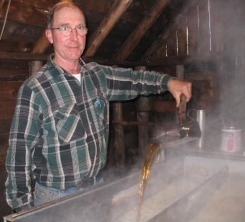 You can either take the Whitingham Maple Festival tour, help farmer Bill in our own sugarhouse, or both. It's up to you. One thing is for sure though, you'll probably want to bring a camera, and you'll probably want to bring some fresh Vermont maple syrup home to your friends and family. It's just that good! 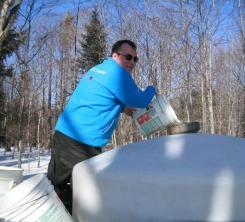 For more information about our maple sugaring operation, visit our Spring Vacations page. We're one of the only Vermont Bed and Breakfasts that have their own authentic, real sugarhouse! 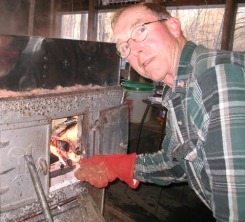 Come join us for the maple sugaring season.